I have now manged to find a Hornets nests and its at the location they used 2 years ago, however only thanks to local Badgers. What happened was the original nest was very well hidden, but badgers found and destroyed it, obviously the Queen and some workers survived, they then moved some 100 metres and back by coincidence to the nest of 2008. The state of the nest as of 30th August is that the activity is much reduced on what it should be, yet as you can tell by these quick pictures I managed to take, it is building up. I would expect this nest to go on until at least end of October, so if the marriage flight of future Queens and Males has not taken place then there is still time to perhaps observe this. But it will depend on how advance they were before the old nest was destroyed. Maybe the fact they are so keen to try again, means this activity is still to come. Another busy female worker leaves the nest in what always seems pre programmed destinations. All leaving worker Hornets can fly off in all ,but the flights path upon emerging always seem determined with direction. 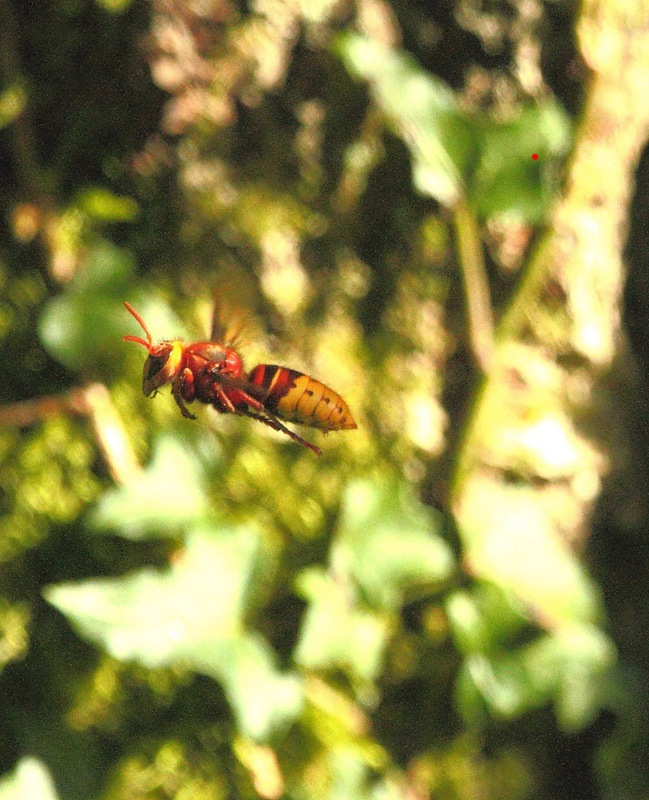 Its sad to hear of Hornets being destroyed and certainly where I live there is not as many as even 3 years ago, which was the year we found them locally. However my little bits of information and these blog entry's and of course some well timed PR is paying off. Hornets are gaining new friends all the time, and I have even been asked to give talks on Hornets and Wasps, indeed one of these talks will be at a gathering of Bee keepers.